Overall Print Size: 30" x 20"
Image Size: 26" x 14 1/2"
The F-15E leader and his wingman are seen at sundown enroute to their targets with two 3000 pound AGM-130 rocket propelled stand off precision guided weapons and an array of AIM-120 AMRAAM, AIM-7M Sparrow, and AIM-9M Sidewinder missiles, providing their own counter-air capability. They also display their conformal fuel tanks, and navigation, targeting, and data link pods. The impressive range and all-weather accuracy of the Strike Eagle and its weapons leave any potential aggressor with "Nowhere to Hide!" 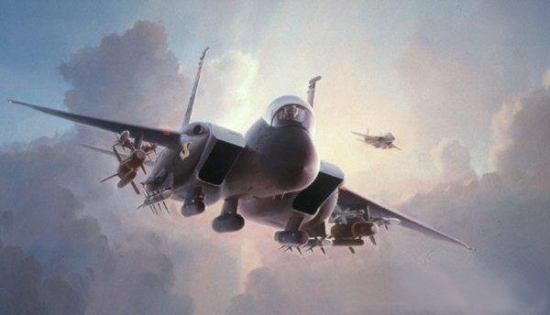 The painting was inspired by a training mission flown by the artist with four F-15Es of the 4th Fighter Wing based at Seymour Johnson Air Force Base in Goldsboro, North Carolina in February 2000.